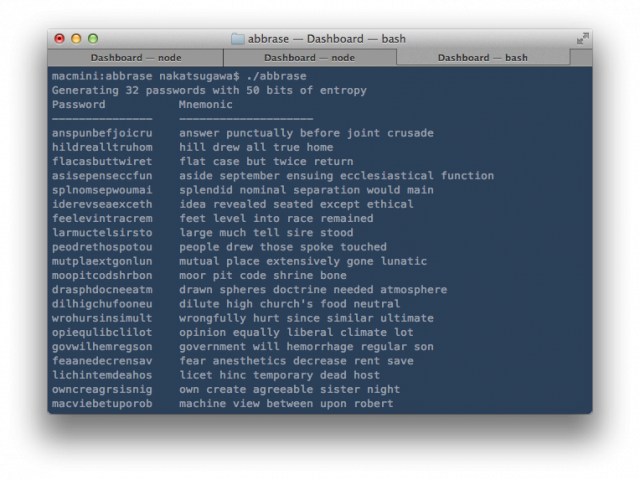 Abbrase is an abbreviated passphrase password generator. An ‘abbrase’ is one of the passwords it produces. It generates a password and a phrase like “phyeigdolrejutt” and “physical eight dollars rejected utterly”. Creating secure passwords is easy. Remembering them is hard. Pwgen makes them memorable though pronounceability. XKCD suggests using a series of random common words, but memorising series of unrelated words can be difficult, and typing long phrases can be tedious. Abbrase is an experiment in generating probable phrases using Markov chains and abbreviating each word to the first few letters. This strikes a balance between excessive password length and excessive mnemonic length. Passwords generated by Abbrase are as secure as a number with the same length. “122079103” and “toldulbal” (tolerably dull ball) are equally hard to attack. Language is the most information-dense thing people memorise. Brains don’t operate on bits. Pi recitation record-holders don’t have thousands of digits in their minds. They map clusters of digits to far more mentally palatable words, memorising a long story instead of a sequence of digits. Memorising a grammatically sensible sentence fragment is easier than a sequence of randomly chosen words. Picking a favourite phrase from the ones generated by Abbrase could make them very slightly easier to attack. A sophisticated attacker could check passwords that are likely to be picked before others. If the attacker can perfectly model which passwords you would prefer, this reduces the security of your password in a proportional amount to the number of passwords you selected it from — if you picked from 32 passwords generated by Abbrase, it makes your password 32x easier to attack (5 bits of security lost). “122079103” and “toldulbal” (tolerably dull ball) are equally hard to attack. Don’t 9 digit only number passwords have much lower entrophy and easier to come accross to in dictionaries??? In theory yah, but a dictionary attack would rarely do just numbers or just letters, they’d go through all [0-9,a-z, A-Z] all at once usually. So in practical sense there’s no real difference.